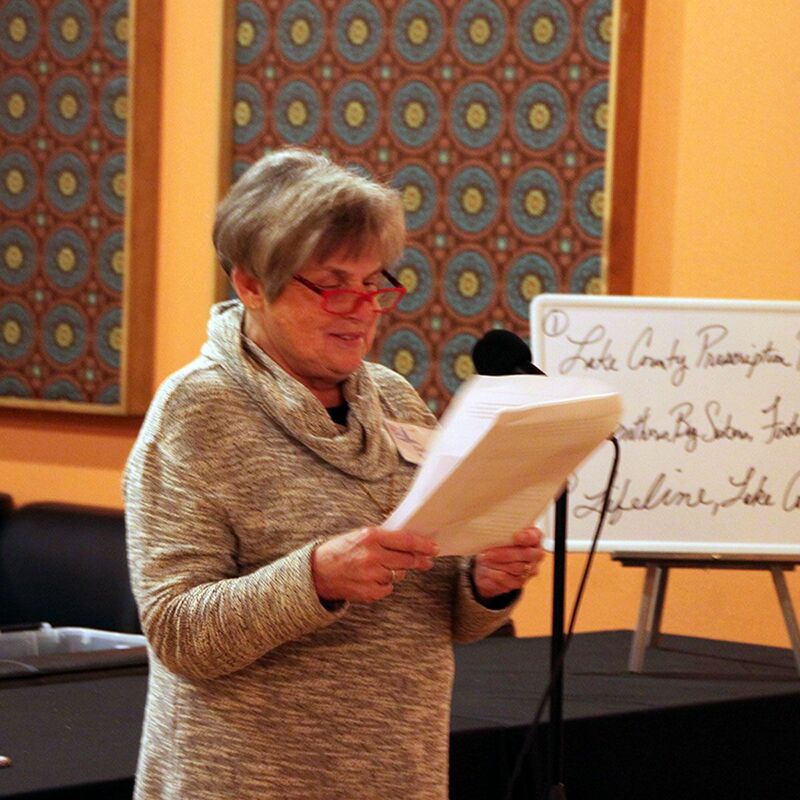 Through our quarterly meetings, we are a giving circle of women from Lake County, Ohio who collectively wish to be a larger impact on our local community. As individuals it can be challenging to make a meaningful contribution, but as a group we can harness our power for maximum impact. Learn how it all works below. At the prior quarterly meeting, members can nominate a locally established 501(c)(3) charitable organization. Three causes are drawn at random. Members meet for one hour, four times each year. Each member brings with them a check and a self addressed, stamped envelope. Members who nominated the three selected organizations chosen at the prior meeting take turns giving 5-minute presentations about the organization and offer a 5-minute Q&A. Following presentations and Q&As, members vote on which cause the chapter will support. Members write $100 checks to the awarded organization. The meeting ends. Depending on membership, the organization may walk away with at least $10,000! That is #thePowerof100! Membership to 100+ Women Who Care, Lake County, Ohio is open to ALL women. The more women we gather, the greater our community impact. Complete Member Commitment Form here. Membership can be updated at any time between full member to two person team or two person team to full member. Changes to memberships should be made prior to the quarterly meeting so the Chapter can properly gauge funds to be collected. If a member is unable to attend a quarterly meeting, they may give their check to another member to deliver on their behalf (which will also serve as their proxy vote during the meeting) or submit a check written directly to the non-profit, within 7 days following the quarterly meeting, despite not being present for voting. Absent members will be notified via email within 24 hours of the meeting as to which charitable cause to write their check. Please submit checks to address listed here. Each member brings with them, to each quarterly meeting, their check and a self addressed, stamped envelope. This allows the charitable organization to mail a tax receipt directly to members without incurring mailing costs. Members agree to contribute to the charitable cause chosen at each meeting regardless of their personal views. Membership commitments automatically renew each one year period. Members agree to give permission to the chapter and the Alliance to use their photos or videos of themselves in promotional materials or release of same to media and social outlets. Membership is an honor commitment, not a legal contract, to the 100+ Women Who Care, Lake County, Ohio Chapter. Members may resign at any time by emailing the chapter requesting to end the membership. Lobbying for a favorite cause immediately prior to the meeting, at meeting location, is not permissible. Only members who have signed a Member Commitment Form, and are current with contributions may nominate a charitable cause. Members MUST complete a nomination ballot prior to meeting to be eligible for the drawing, charitable cause nominations end at 6:30pm, the start of the meeting. Members may submit only one charity for nomination, and can only be listed on ONE nomination ballot per quarterly meeting. Duplication of member signatures on entries will not be accepted and will be removed from the “hat”. Members of a registered team of two are permitted one charitable cause nomination per team, per quarterly meeting. Only one person’s name from the team may be listed on the nomination ballot. If chosen, that person will present the teams charity. New members are permitted to nominate a charitable cause and vote at their first meeting. They must be prepared to write a $100 check. Charities may be nominated more than one time, by different members, at any quarterly meeting. If a charity with multiple nominations is drawn from the “hat”, the member whose name appears on that nomination form will be the only member permitted to present and answer questions. A backup charitable cause will be chosen at each meeting, in addition to the three causes set to be presented. Should one of the three chosen causes, for any reason, be found not presentable, the Steering Committee will call upon the backup cause to prepare for presentation. Ultimately it is the charity’s responsibility for stating and proving they are an established 501(c)(3) while being vetted by the member. The presenting member must request a copy of the “Letter of Determination” and a current IRS “990” form. This letter and form should be known to the non-profit and available to them. Presenting Member gives this documentation to the Steering Team at the time of nomination or mailed or emailed no later than 2-weeks following the quarterly meeting at which the non-profit is chosen. Nominating members are asked to do their due diligence when vetting their charitable cause. Charities cannot be startup charities and must be an established 501(c)(3), recognized under the same name for a 12-month period. Charities cannot have been awarded any funding from our 100+ Women Who Care, Lake County, Ohio chapter in the past 2 years. No Political charities or Political advocacy charities will be considered. National charities will not be considered unless there is a local group affiliation and the donation will only benefit Lake County. Charities that act as a bridge between caring donors and charitable causes will not be considered. The purpose is for 100% of our member contributions to stay in our community and be given directly to the charitable cause chosen. Members who have completed a Member Commitment Form and are current with contributions may vote at a quarterly meeting. A members’ visiting guest may vote after they have first signed a Member Commitment Form. Guest must be prepared to write a check at that meeting. Donations will be given to an established 501(c)(3) charities/non-profit organizations serving our community, as outlined in these guiding principles. By ballot, membership will vote, once per member or once collectively per team, understanding that the member majority rules. Each member agrees to donate their $100 to the chosen charitable cause regardless of personal views. If a member’s name is drawn and her charitable cause is not chosen, member will still be eligible to nominate the same or a different cause at the following meeting. In the event of a two-way tie, membership will be provided with the names of the two charitable causes and a second vote will be taken. If the second vote results in another tie a random drawing will be completed. In the case of a three-way tie a random drawing of the three charitable causes will be completed. If any member is compelled to also write a check to the other 2 presenting charities, they are welcome to do so. The steering team will process the delivery of that payment for the member if they wish. In the event of a disqualification of a member chosen non-profit, chapter will default to the non-profit in 2nd position for the funds from the membership for that quarter. Causes chosen for presentation that later wish to be retracted from consideration should give notice no less than one month prior to the meeting date. After checks are written and the steering team makes closing announcements all members are to attach their check and their envelope, UNSEALED, to the back of their name badge and return their name badge to the check-in/out table. Members will be notified by email of the time and location for the funding award presentation to the chosen charity. All members are encouraged to participate. Funding awards will be hand delivered to the charitable cause by members who are able to attend. This will occur within 7, but no later than 14 days following the quarterly meeting, in which the non-profit was chosen. This will allow time for collecting checks from the members not present, and to arrange the best day/time to present the award. Charities are responsible to complete the Charitable Cause Recipient Form with a steering team member. It must be signed by a director or principal of the charitable cause, who is able to make decisions for the charity. By signing the Charitable Cause Recipient form they are agreeing to the terms of the chapter. They may make copies of this form for their record. The 501(c)(3) charitable cause/program/non-profit has to agree NOT to use the names of members for future solicitations or give the information out to the public. If the charitable cause does not adhere to this condition after they are awarded the donated funds they will be removed from any future consideration. Charities must agree to include, recognize and promote 100+ Women Who Care, Lake County, Ohio in any form of media where listing of awards granted them and/or funding sources are noted, in lieu of an individual member's name. Charities must agree to provide each individual member with a tax receipt for their donation within three months of receipt of their award, using the self addressed stamped envelope provided to charitable cause at presentation of the award. If no envelope is provided, the charity agrees to send a tax letter upon request of the member. Charities awarded donations from this chapter will not be eligible, by any member, for 2 years, following the quarterly meeting date in which they were awarded funding.